“These pancakes need to come with a warning,” says Bryan Stoffelen. “Once you’re finished, you’re going to want to lay on the couch for the rest of the day.” Crisp and golden-brown on the outside and meltingly tender and cake-like in the center, the lofty, dinner plate–sized beauties arrive at Bread & Butterfly’s tables oozing with butter and warm, pure maple syrup. What’s his secret? Besides top-shelf ingredients like King Arthur flour, organic local eggs, unsalted European-style butter, and pure maple syrup from Virginia, Stoffelen uses an alarming amount of baking powder—10½ teaspoons—and a generous pinch of Diamond Crystal kosher salt. That extra leavening creates plenty of air pockets for maximum fluffiness. 1 In a large bowl, sift together 4½ cups all-purpose flour, 10½ tsp. baking powder, 3 Tbsp. sugar, and 1 Tbsp. kosher salt. In another large bowl, beat 3 large eggs and 4 cups whole milk with a whisk until blended. Meanwhile melt 9 Tbsp. unsalted, European-style butter in a small saucepan over low heat. Slowly whisk the melted butter into the wet ingredients. 2 Using a wooden spoon, fold the dry ingredients into the wet ingredients and stir until thoroughly combined but still lumpy. Do not overmix; it can result in tough, rubbery pancakes. 3 Let the batter sit undisturbed for at least 30 to 60 minutes, or refrigerate overnight. This will hydrate the gluten for a more tender pancake. 4 Heat a griddle to 325°F (a simple one from Black & Decker works) or medium to medium-low if cooking on the stovetop. Add 1 Tbsp. butter and let it coat cooking surface. If butter starts to brown, reduce heat. 5 Ladle ½ cup (or 4 oz.) of batter into the pan. Cook approximately 3½ minutes. (If pancake is browning too quickly, reduce heat.) When bubbles appear all over the surface and start to burst, slide a spatula underneath and flip. Cook another 3½ minutes. 6 Flip only once, and don’t mash down with a spatula, which will deflate and toughen the pancake. (To check for doneness, insert a toothpick in the center to see if it comes out clean.) 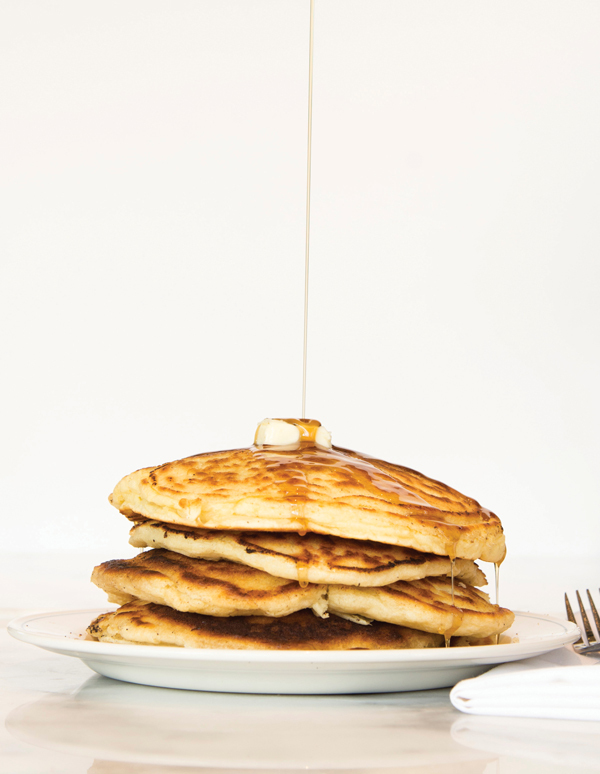 Keep pancakes warm in an oven set to 200°F until ready to eat. 7 When done and still on the griddle, place a few generous pats of butter on half of the pancakes and melt by placing an unbuttered pancake on top of each. Stack on a serving dish and saturate in warm syrup. A native of Fairfax County, Virginia, Stoffelen moved to Atlanta in 2010 to join the line at 4th & Swift and later Cakes & Ale. 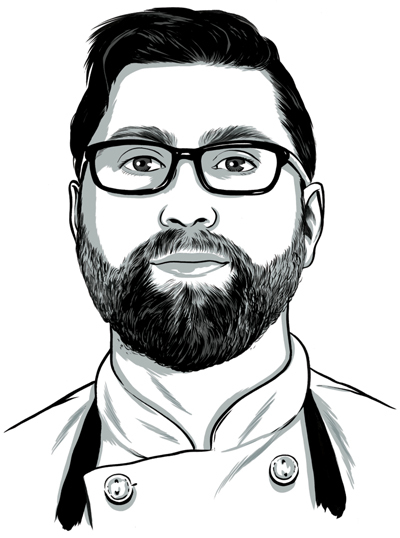 He worked as chef de cuisine until last December, when he took over the kitchen at Bread & Butterfly.